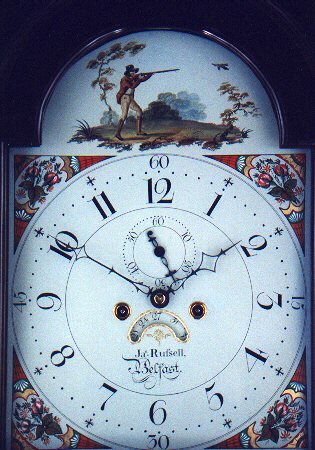 James Russell of Belfast Longcase Mahaogny Circa 1805 - Height 90in. This Longcase Mahogany Archive's Maker - Russell, Belfast. James Russell recorded Belfast, 1804-09. Good quality mahogany case. See Grandfather Clocks & Their Cases, page 293, for similar examples. 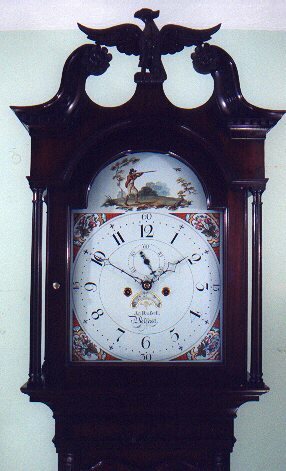 13" breakarch painted dial with shooting scene to arch, seconds and date. 8 day. Hourly (rack) striking. Russell, Belfast. James Russell recorded Belfast, 1804-09.